One hour. That’s all you’re going to need to whip up this breath of fresh air. You probably know by now that I am completely and totally all about instant gratification, especially when it comes to knitting projects. You will recall from the BIG Hat that there are a couple of ways to achieve a quick knit. You can either choose a nice small project like these knitted hearts, or use humongous needles like I did with the infinity scarf, or you can totally do both, like we did here. Well, the needles aren’t exactly ginormous, but they are big, that’s for sure. I have created a pattern that has enough stretch that this neck warmer will fit everyone from a small child to an adult. I have also fancied up the pattern a wee bit, so that you achieve an eye pleasing twist in the yarn that resembles a faux cable, but it is way way easier. No cable needles to get tangled up in, and no real big daunting fear of leaning how to cable looming over your head. So it goes like this. 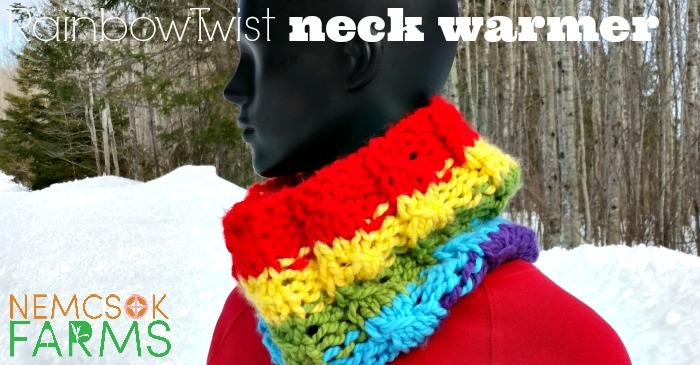 The rainbow twist stitch is worked over three stitches, and it is really really easy. You slip the first stitch as if to knit, as indicated in the second square of the image below, then knit the next two stitches. Now you bring your left needle back to the stitch you slipped, I am pointing to it in the third frame below, and insert your left needle into that stitch, and pass it over the two stitches you knitted after slipping it. You’ll have a strand of yarn drawing a slightly twisted arch over those two knitted stitches. Now, you knit that stitch that you just passed over, yes, that one just on the tip of that left needle. Voila, rainbow twist stitch completed. Yay you! Told you it was easy. Cut yarn leaving about 24 inches to secure the last stitch and to sew the seam. 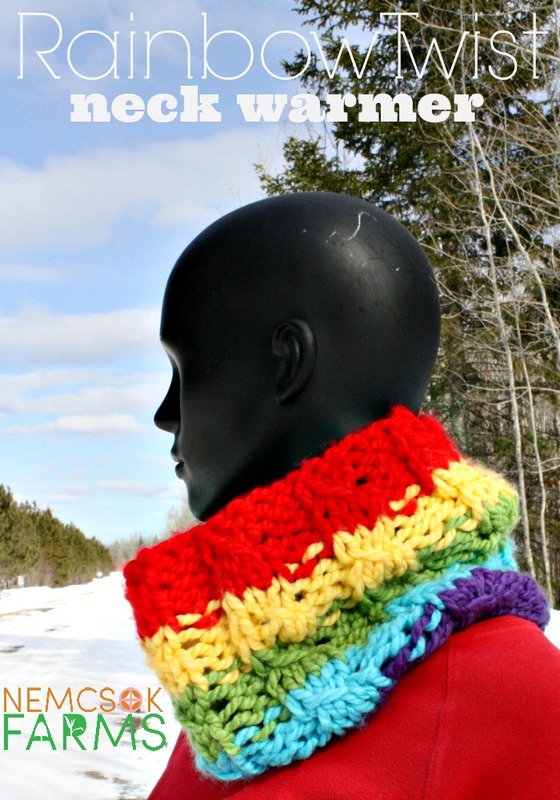 If you purchase balls of yarn for this, you will have enough to make several neck warmers – Enjoy! Looking for a great knitting pattern? 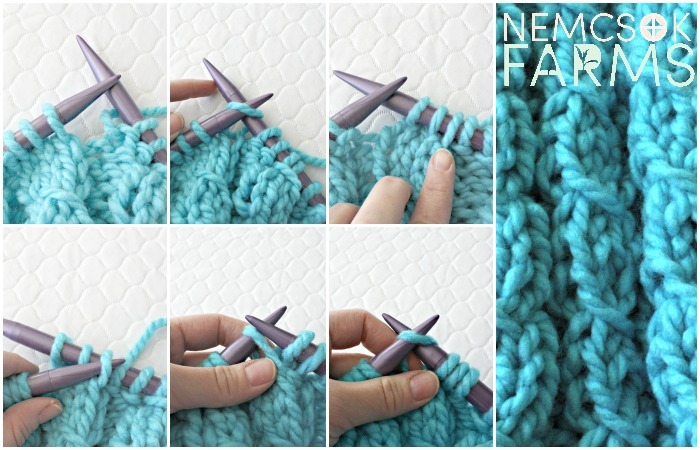 Need a little help with the mechanics of knitting? Leave a comment, I’d love to help you out.